Located in Downtown Jerusalem, within walking distance from the Old City, Leonardo Hotel Jerusalem is one of the most remarkable hotels by the prestigious hotel chain Fattal Hotels. The hotel’s proximity to the light rail stops will help you commute inside Jerusalem and easily get to all of the city’s leading attractions, best restaurants, nightlife centers, the vibrant Mahane Yehuda market, the Western Wall, and more. Staying at Leonardo Jerusalem, you will enjoy an experience that combines a unique atmosphere that can be found only in Jerusalem with history and a perfect vacation. The hotel is perfect for all sorts of travelers: couples, families, groups and business travelers. Guestrooms are big and spacious, the meals are fantastic, and the service is personal and indulgent. Enjoy a classy vacation for great prices and with an amazing environment. We all know that in order to really get to know Jerusalem, one has to stay here. A simple trip of a few hours just won’t do it. Staying at Leonardo Jerusalem, you get to enjoy a recreational vacation, see beautiful views and choose from a wide range of rooms and suites with everything you need for a dreamy vacation. In addition, the culinary services are top quality and there are special amenities for people who observe religion. 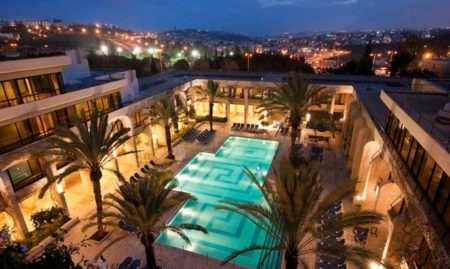 Visit the holy city for a romantic or a family vacation at Leonardo Hotel Jerusalem and enjoy spa treatments, rich Israeli breakfasts, an amazing summer pool (May – September), children’s club, fitness center and free Wi-Fi. Planning a private celebration or a business event? Leonardo Hotel Jerusalem offers plenty of options for hosting private or business events of all types. The hotel has seven different venues for hosting small or large events of up to 540 guests. . If you’re planning a wedding, bar/bat mitzvah, reception, private dinner, convention, product launch or any other type of event, Leonardo Hotel Jerusalem will provide you with the perfect space with advanced audiovisual equipment and an attentive and professional staff that will accompany you in every step of the way. Stay 1 night in the hotel for training with my family in Jerusalem. It service and staff was very good and the room was excellent. Breakfast was grate and the kid's love the food. The hotel near the old city (10 Min walking) . I recommend this hotel. You will love it. This is my first trip to overseas and I choosed to be in Israel. I arrived on SHABAT which was amazing as it was different than what I was expected. I was really happy to what is SHABAT meaning in Israel. The food was so delicious but I found a lot on onions in the most of the salatd (which I hate). The room is very clean and confortable. I must to say that the staff of the hotel are so polite and helpful. The best place in the hotel is the Bar which I get a good service and the best drinks ever. Thanks for ibrahem (the manager on duty) and Ali (lobby manager) for providing us with an excellent service. I will recommend for all of the tourists to stay in Leonardo Jerusalem Hotel. Good location, clean, WiFi (not always fast), large buffet breakfast (likes the cappuccino and lattes), good showers with plenty of hot water. I liked being near Jerusalem’s Old City. Did not like all the tour buses and hawkers near the entrance. Spacious, designed and richly furnished Superior Room for hosting couples or couples with 1 child. Beautiful Superior Rooms with balcony. These rooms can be booked with a Twin bed for accommodation of up to 3 guests. Large and spacious room for family accommodation – beautifully furnished. Extraordinary beautiful suites with balcony. Suites can be booked with a Twin bed. Elegantly furnished spacious and luxurious suite with a balcony. Perfect for a dreamy romantic getaway.